As we are now almost at the end of the 4th month of Tag Tuesday I'm building up quite a little bundle of tags and although they look lovely in this little wire and organza box, I'm thinking they are soon about to outgrow it ! I have thought about hanging them on a string above my workshop windows, then I thought I might like to mount them onto a large canvas and hang them in a more prominent position. Then Barb Cady sent me a link to her blog to show me how she was displaying her lovely tags from the challenge, she was using a spiral sketchbook, I thought it was a lovely idea, the spiral bound book has a bit more give for those tags with raised areas, so I think I'm going to do the same, I remember that I picked up a little spiral sketchbook in a charity shop around Christmas time and haven't used it yet, I knew it would come in handy one day. My workshop tidy up produced a bag of cards I had forgotten about and and I found the perfect little scene of children playing in the snow and sledging with a stone bridge in the background. Its a really glittery tag I love Christmas cards like this and it's nice to be able to use elements from two to make a keepsake scene. Once I have a few of the tags into the my little book I'll post some pictures. and I'm drawn to it a lot in my work. This created some interesting areas to add beads and embroidery. glass seed beads, crystals, pearls, french knots and bullion knots. Tie: Embroidery thread twisted cord. I bought it over a year ago and she didn't really get a lot of wear out of it because it got too short length wise before she outgrew it, it occurred to me last week that the top actually still fits her, except it's too short. so I cut the bottom from another t-shirt from the quilt/rug pile and came up with this. I didn't get a picture of the pink top on its own before I added the green bit but I'm sure it's easy to see what it looked like before I added the green bit. I just stitched this by hand, tshirt fabric is great for this kind of thing as it doesn't fray. I did one line of running stitch in 3 strands of pale blue embroidery thread along the very bottom of the pink top, then another with pink in a wavy line further up to join the pieces together, then another in green using french knots. to match the one I did on the front with a blanket stitch in pink around the edge. The one on the front is covering a transfer image that was already there, I thought the batik fabric would give it a more 'hippy' look. I placed it on top and ironed. First I opened a little A6 sketchbook from the past when I was at college all those years ago in the Borders when I made the 'Flower Quilt' The annotation beside the little watercolour flowers mentions applique as a proposed idea, I was reminded also that the six watercolour panels that I made were actually the second idea, the first being a single panel which I did make. I wasn't happy with it, mainly because I chose peach for the background fabric. I used a dip-dye method, I enjoyed the process but the end result didn't seem a good fit for the quilt so I didn't use it. I'm sure I must have this, probably in my portfolio with all the paintings and drawings, I will have to look it out. I remember now that worked on the six smaller panels during the summer break. separating all the squares, unpicking and removing all the stray threads. inspired again by the fabrics. I'm thinking that it might be nice to make more panels for the back of the quilt using the same process I did back then after all I do have a lovely new set of the same watercolour dyes I used, actually this quilt was the reason I bought them the first time round. Looks like my mend and reduce job is turning into another project. it has progressed a little bit more . . . .
of Charlotte's baby clothes . . . .
which I re-fashioned into a fish shape and appliqued on. This is block number 10. A very quick windmill pieced block made from a set of two little tops one with little stars on, the other plain with a flower on the front which I cut out and appliqued onto the middle. It's time I got more blocks done I think . . . . ! I would like to invite you all to have a little peek into my new blogshop. a place to show my work and I'm enjoying listing everything in the one place. I put a link on my side bar a few days ago and have been gradually getting all the things in there. Oliver Twist short length yarns on top and couched on some dark green chenille. I made it a quarter of the size. and added some tiny seed beads into the ground area. backed it with card and added a selection of hand dyed yarns and a white ribbon for the tie. Embellishment: Yarns, Fabric flower and beads. I'm quite excited about spring :) the sign of things to come, looking forward to the warmer weather and spending more time out in the garden, already there is more sun shining into my little studio each day filling it with light and warmth. He asked me what kind of flowers I would like to have planted in them. I decided as they are such tiny cute little boxes that it would have to be violas, pansies. thread along the middle line between the two colourways. she pulled all of the larger sequins leaving little pulled french knots. I want to work more knots into the binding and on the quilted blue sections for now. Labels: hand embroidery, machine quilting, markal paintsiks, painted quilt, pental fabric watercolour dyes. This is my first quilt. I am only now getting around to photographing it. ( blogged here) but these were both far away from being finished quilts. This quilt was a college project and was inspired by a sample book from the Fabric Guild, picked up for a couple of pounds from a fabric and curtain store near the college I attended in Hawick . The sample fabric pieces were large squares each of which I cut into four smaller squares and used in the quilt around the edge, in total there are 14 of these large blocks of 4. The six centre blocks are my own fabric designs inspired by the sample book. 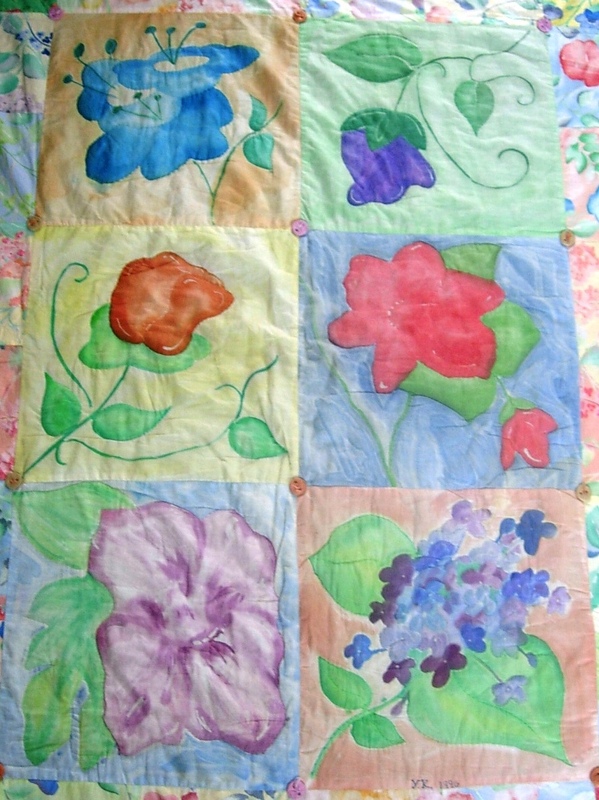 I used batik method and watercolour dyes to paint each flower panel. The whole quilt measures 67 x 81 inches. Big enough to top a double size bed. as its too big and heavy to attempt with my machine. The problem is its too big and heavy for my own washing machine. There is quite a heavy blanket inside, great for warmth but not for keeping clean. I have almost taken it to the cleaners a few times, but not keen to do this for a few reasons. I decided to start on the repair work yesterday. which at the moment is plain old green sheet. I'm thinking something this size might be better. This is just folded over to give an idea of how it would look, showing just one line of squares surrounding the centre blocks. the removed patches could go on the back around the edge or in the middle. I'm also thinking I might replace the blanket for a fleece one to make it lighter and machine washable. I might also try quilting it. I made a start by removing the buttons and the green backing. bit of a messy job ! I'm thinking I might cut them into smaller pieces and make a more interesting back to the quilt. I still have some of the plain coloured pieces of fabric that came out of the sample book, I will have to have a look them out, I might be able to combine them in some way. any suggestions /pattern ideas are most welcome.